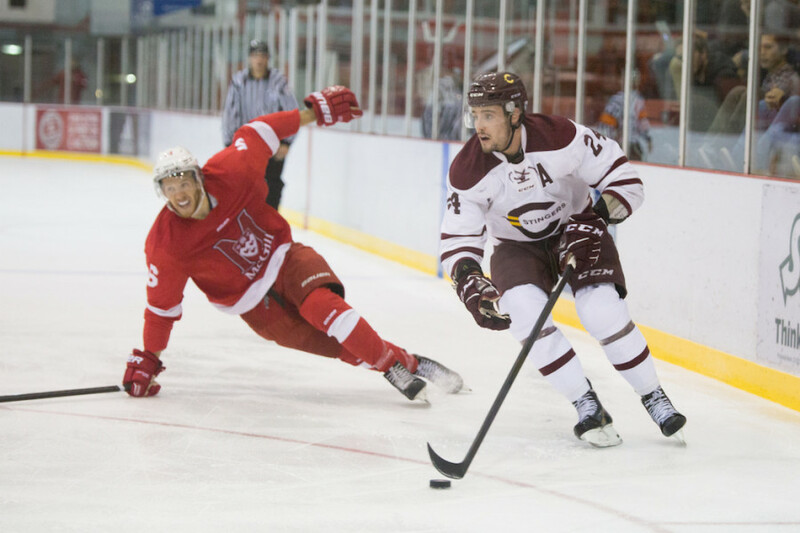 It is perhaps Montreal’s greatest cross-town rivalry when it comes to university sports. Between Concordia and McGill, the love is never lost. With the regular season coming to an end this weekend, the rivals meet for a final time to finish a back-and-forth season series that started with Concordia’s very first game of the year. “It’s more than just another game for us,” said Stingers head coach Marc-André Élement who is set to return to the bench for Friday’s game after serving a two-game suspension last week. Élement’s Stingers are excited to prove that they’re the team that beat their rivals to start the season, not the team that’s had trouble stringing together wins since the holiday break. After an outstanding first semester, the Stingers have struggled recently, dropping three consecutive games before snapping that losing streak against the Royal Military College Paladins last week. 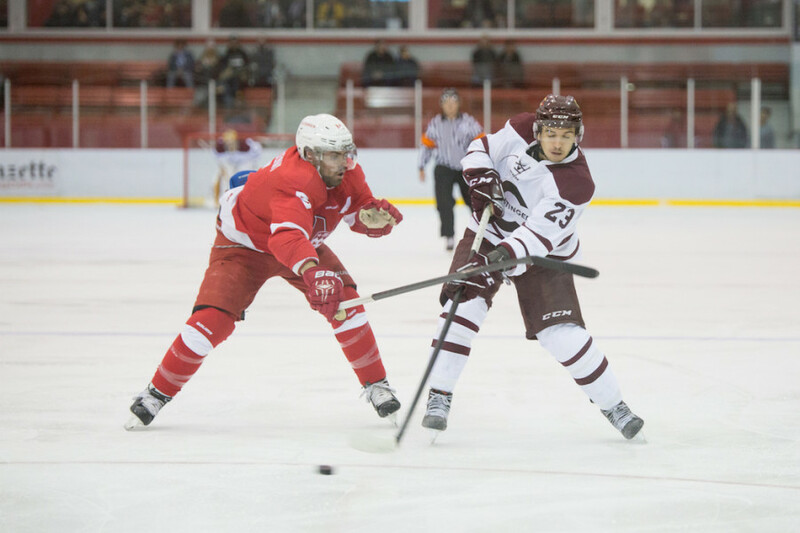 With the playoffs coming up, the team see a game against McGill as a chance to plant their feet firmly in the kind of hockey they played to start the year. The Corey Cup atmosphere has spread to Hudon’s teammates as well. U Sports’ leading scorer, Anthony Beauregard is looking to thrive on the atmosphere of an Ed Meagher arena filled with fans of the cross-town rivalry. After watching the three previous battles between these two teams, it’s not hard to see why these players are so excited. Every meeting between the two this season has resulted in a tight, exciting game that reminds fans why the duel is so hotly contested. While McGill may have led Ontario University Sports’ east division through the season, they’ve had their hands full every time they’ve met the Stingers. 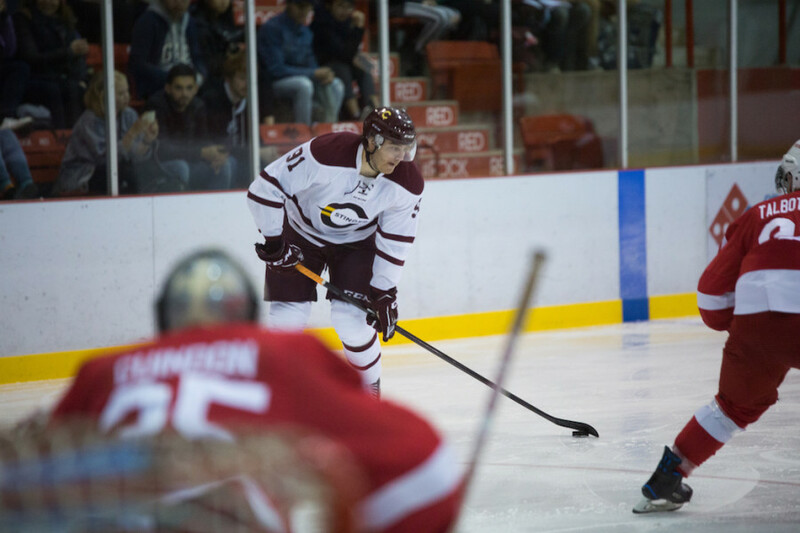 From the tense, hard fought first game of the season on Oct. 13 that gave Concordia a 3-2 win, fans of both teams have been treated to the best hockey either team has played. McGill took the next two games. First in a 2-1 victory on Nov. 17 and then in a controversial overtime game the following night. All three games were decided by a single goal. As the teams prepare for their final matchup of the season, many may favour McGill to come out on top. It’s no accident that they lead the OUA in points. With a smothering defense, a top goaltender and a top five offense in both goals and shots, they are one of Canada’s deadliest university teams. The Stingers aren’t taking their opponents lightly but they certainly aren’t letting themselves be intimidated in their home arena on such a special night either. Puck drop is set for 7:30 p.m., Friday night at the Ed Meagher Arena.